Apollo T was a gentle giant who was rescued by Karyn Sabin from a shelter in the Central Valley. He was loved by the shelter staff, who gave him more of a chance than most dogs his age and in his condition get. Karyn tended him, took him into her home, and gave him a great place to live both physically and mentally. Unfortunately, life had dealt Apollo a really bad hand and we learned that he had cancer. Although he passed away much too soon, as you will see below, Karyn and her dogs gave him as good a home as was possible. His earlier life obviously was not good, but Karyn gave him happiness and a quality life for the time she had him. Please read Apollo’s story below through Karyn’s eye and words. Dogs live for the moment, and Apollo’s final chapter was a wonderful one. 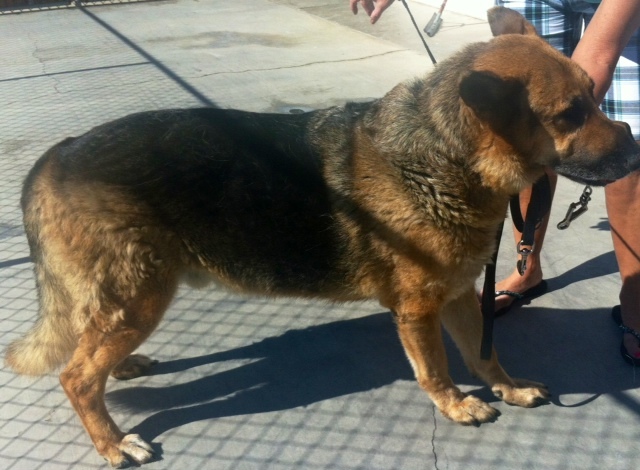 In June I received a call from a small, overcrowded Valley Shelter about a ” huge, male German Shepherd about 6 years old, who was a favorite of the staff and they were extending his time day by day”. 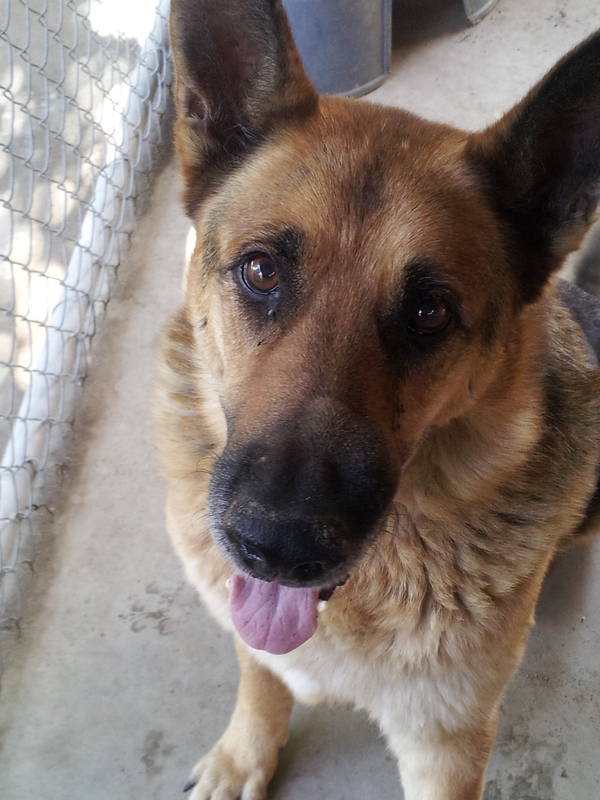 I agreed to look at him and was met by a sweet, old Gentle Giant. (Shelters love to underplay the age, to get people to look at a dog). Apollo was picked up as a stray, but at some point someone cared enough to have him neutered. He was at least 10 years old, over 100 pounds and had a large growth on his nose and one side of his face and a growth on his throat bigger than a grapefruit. I took him home with me, thinking that he may have cancer and could be a Thulani candidate. A biopsy showed Apollo did have cancer–bone cancer. Not the news I wanted to hear as it is very painful when it has spread. But, Apollo did not seem to be in pain and was enjoying life living with a pack of dogs, sleeping inside and going for walks. Apollo was accepted into the Thulani Program and while we waited for a foster home, Apollo remained with me. Soon, his favorite playmate became Mystique, a 9 month old GSD. They were very amusing to watch. Apollo was one of the sweetest, most affectionate GSD’s ever. After a life outdoors without much from his prior family (he had terrible flystrike and did not even know sit), the end of his life was a complete contrast and could not have been better. On Monday, July 30th, Apollo was put to sleep due to failing health and lack of quality of life. This Gentle Giant crossed the Rainbow Bridge while lying side by side with me, with one of his paws across my shoulder. His time in Rescue was short, but having him at my house enriched both my and his life.